The review which you are about to read covers an account which befell the Harver family. It is all the more tragic in that some of the family were still children. Had they lived very, very long lives they could not have expected nor would they have wished to see as much of the mad and macabre as they were to see that day. For them, an idyllic summer afternoon camping became a nightmare. The events of that day were to lead to the discovery of one of the most bizarre crimes in the annals of British history and those who escaped from Cannibal Farm. This British chainsaw massacre of a movie pays homage to its inspirational predecessor. Writer and director Charlie Steeds doesn’t hide his influence for Cannibal Farm as he tries to find a fitting mixture of the brutal realism of The Texas Chain Saw Massacre while providing comical relief characters of its sequel. 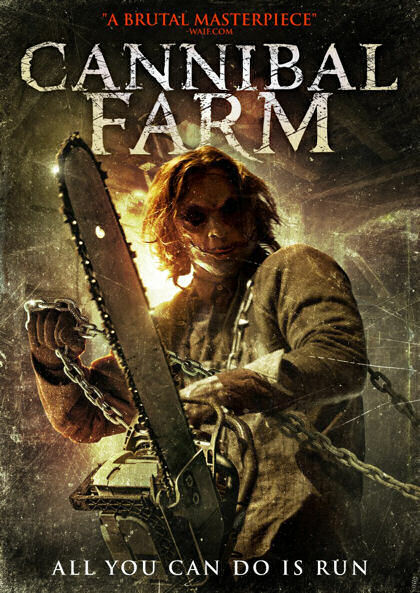 The mixture of The Texas Chainsaw Massacres 1 & 2 with a little Last House on the Left thrown in gives birth to a fun and brutal film that wobbles as it finds its footing to define its own identity. A familiar horror set-up leads to Cannibal Farm, a great place to get a home cooked meal. The descent through this farmhouse is a House of 1000 Corpses, blood covered mess. As Steeds tries to carve his own niche in the familiar formula, his second feature does get spread thin covering a lot of backstory and sub-plots. Perhaps the filmmaker was finding his footing as well. Don’t let the name fool you and get lost among the horror movie shuffle. There are some fun spots and a good amount of promise on this Cannibal Farm. I look forward to Steed’s next horror project.